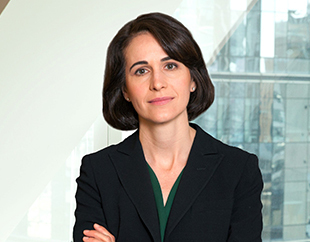 Katherine Pringle represents clients across a broad array of industries in complex commercial disputes, including at trial. She is an accomplished appellate advocate, and her work in this regard includes significant recent victories in the U.S. Courts of Appeals for the Second and Tenth Circuits. She particularly excels in handling large cases that depend on scientific or economic evidence and expert testimony. In addition, Ms. Pringle has an active white collar practice. She regularly represents clients in the financial services and other industries in connection with investigations by federal and state prosecutors, the Securities and Exchange Commission, FINRA, and other regulatory bodies, and counsels clients with respect to their obligations under the Foreign Corrupt Practices Act and other federal laws. Because of the nature of Ms. Pringle’s white collar work, many of her most successful matters have not resulted in public charges and remain confidential. Representation of Silverstein Properties in a series of insurance, contract, and tort disputes arising out of the collapse of the 7 World Trade Center building on September 11, 2001. During the course of one of the cases, Ms. Pringle and the firm worked with structural engineers to create a computerized model of the building down to its bolts, and then, with fire experts, used this model to map the spread of the fire by cubic inch through the building. The representation resulted in the successful resolution of all litigation following the collapse, including the grant of summary judgment in favor of defendants in a long-running suit by Con Edison concerning the design and construction of the building, which was affirmed by the Second Circuit Court of Appeals. On behalf of a developer and licensor of wireless communications products, Ms. Pringle and the firm obtained a Tenth Circuit decision on interpretation of patent licenses, which reversed trial decisions and embraced the arguments of our client. Friedman Kaplan was brought in as appellate counsel following a disappointing trial on licensing and patent claims, and obtained a decision overwhelmingly in our client's favor. The firm continues to handle the case on remand. Representation of an AM Law 100 law firm in the successful defense of claims of legal malpractice and claims under Judicial Law Section 487. The New York Supreme Court granted Ms. Pringle and the firm’s motion to dismiss all claims, and the decision was upheld by The Appellate Division of the New York Supreme Court, 1st Judicial Department. Representation of the world’s largest manufacturer of artificial turf fields in a fraud and breach of warranty action. On summary judgment, Ms. Pringle and the firm secured the dismissal of trademark infringement, defamation, false advertising, and related counterclaims valued by the adverse party in the case at more than $100 million. Following a two-week jury trial, the parties in the case reached a settlement. On behalf of the Audit Committee of a NYSE-listed company, Ms. Pringle and the firm conducted an investigation of charges of sexual harassment and sexual assault against the company’s CEO by a subordinate. Because of the urgency of the matter, at the request of the company, the entire engagement was conducted to completion in 24 days. Representation of a leading New York law firm and one of its partners in connection with defense of allegations that the firm aided and abetted a client who had been accused of fraud related to a loan agreement for a real estate transaction. Ms. Pringle and the firm obtained a ruling by the Second Circuit Court of Appeals supporting political asylum for a refugee from Côte d'Ivoire. Friedman Kaplan convinced the Second Circuit that the immigration judge had ignored key facts suggesting that the petitioner, who had suffered multiple beatings on account of his participation in a political rally, had a well-founded fear of future persecution in his home country. Ms. Pringle has an active pro bono practice, which has included litigation involving a religious organization's First Amendment right to conduct outreach to the homeless, and representation of families before the September 11 Victim Compensation Fund. She also served as co-counsel to the Kerry for President Campaign in litigation concerning the 2004 Florida election ballot, as well as co-counsel to plaintiffs in Jacobs v. Seminole County, concerning the 2000 Florida presidential election count. Prior to joining Friedman Kaplan, Ms. Pringle practiced at Miller, Cassidy, Larroca & Lewin, LLP.